Can we prevent food poisoning and “stomach bugs”? Most of us are all-too-familiar with the feeling: the sudden onset of slow, churning in your stomach followed by fever, body aches, malaise, and loss of appetite. Eventually you cannot keep anything down. It seems the illness must inevitably run its course and there is nothing on earth that can change it. True enough. Food poisoning and “stomach bugs” strike dread in the hearts of many. Whenever there is an “outbreak” of something that causes these symptoms, there is often a chain-of-communication about its origin via word-of-mouth to inform others in case of further illness. When the outbreak is connected with a restaurant or other business that serves food, it makes the newspapers and the health department gets involved. Last week, one of the businesses my family has supported and counted on for 25+ years announced that it had an outbreak of salmonella originating from its deli department. The Boise Co-op is a local health food store that provides a variety of organic and natural foods including grassfed beef and other natural meats and poultry, raw milk and other dairy foods, fermented foods, organic produce, and bulk spices, herbs, and others such as beans, grains and nuts. Their offerings include local products from farmers I personally know, and national brands that I have researched and trust, which we buy and are frequently found in our kitchen. I am incredibly dependent upon and grateful for this business to provide my family with healthy food. A customer has now filed a lawsuit against the store because she came down with symptoms associated with food poisoning after eating a tuna fish sandwich purchased by her husband, a tradition that she has been engaging in weekly for sometime. The hysteria around this event has also got me thinking: we do have choices. We are not powerless. We do have the ability to learn about how to better care for our bodies and our health and prevent illnesses like this and others. I’m disappointed that as a culture, we look for ways to put the responsibility for our choices on other entities rather than educating ourselves and taking charge of our own health. Source of the food matters. Education is not limited to what doctors tell us to do when illness strikes. The lifestyle habits and choices we make about what we put on and in our bodies, such as food, do affect the health condition of our bodies. When I was a child, I remember coming down with nausea and gastrointestinal symptoms frequently. I hated it so much, I preferred having a head cold and sore throat for a week to nausea that resulted in throwing up. It happened often enough that I began to think it was “normal”, and just something I’d have to deal with from time-to-time. I’ve always feared and loathed the feeling of being sick to my stomach and having to go into the bathroom to kneel in front of the toilet to vomit. Back then, I experienced gastrointestinal illness two to three times a year. What if there was a way to minimize gastrointestinal symptoms or eliminate incidence of “food poisoning” and “stomach bugs”? Here’s the good news is: there is! If you know you are already in the throes of gastrointestinal distress, it may seem like nothing will stop it. You can’t keep anything down and you feel like death warmed over, so what can you do? It depends on what’s in your gut, how much of it you’ve come into contact with, and what you do during the illness. Remember: the way you treat your body before, during, and after illness can have an affect on duration, severity, or whether it manifests into much of anything at all. I’ve seen instances in my own family where nothing we did seemed to make a difference. When my son was younger, he had a number of these kinds of illnesses. I’d not offer him anything else except teaspoons full of liquids such as fermented beverages and broth. But sometimes no amount of probiotics and nourishing broth seemed to matter until the body was finally read to accept them. So I continued to offer these to him, and eventually his body could accept more and more of these liquids, and then he was able to keep food down again. On the other hand, prevention goes a long way. As I mentioned, it was not uncommon for me to come down with food poisoning or “stomach bugs” regularly in the past; sometimes two or three times a year. But then something remarkable happened: when I learned about eating clean, real food my incidence of these illnesses has completely disappeared. It’s true: I haven’t had any kind of full-blown stomach bug in 10 years. Now when I feel any kind of nausea coming on, which is pretty rare, I take this probiotic and the feeling subsides within 5 minutes: Enzyme Formulations Formula #17 powdered probiotic. This product must be obtained from a health care practitioner. Follow the link to find a practitioner in your area. It is the most effective method of eliminating nausea I’ve come across. It is also effective on abdominal cramps. My husband and son have also had success with this probiotic. I also recommend the following probiotic supplements as a way to prevent and maintain optimal health via Amazon affiliation: Prescript-Assist, Bio-Kult, Genestra HMF powder. If you find yourself already “too far gone”: take care of yourself, rest, hydrate as much as possible with small amounts of broths and fermented beverages, and take probiotics until your symptoms improve. Keep the following in mind with regard to preventing “stomach bugs”. What else can I do to prevent “stomach bugs”? 1. Avoid processed foods and prepared foods. That includes grains, factory-farmed meats and animal products, conventional produce, and vegetable oils (think canola, soybean, corn, peanut, safflower, and sunflower oils), and foods that are genetically-modified. Anything in a package, box, or can is suspect for containing ingredients or being processed in a way that can upset the delicate balance of your digestive tract, immune system, and overall health. Animal foods from confinement environments can definitely contain residue from antibiotics and hormones, known disruptors of gut flora and culprits of chronic disease. These products may seem cheaper or more convenient, but the real cost of consuming them can come later down the road in nutrient deficiencies, frequent illness and sick time, doctor visits, and long-term chronic disease. Read 4 ways to avoid GMOs in your diet and 10 ways to protect yourself from superbug bacteria. See #3 for recommendations of what to eat and why. 2. Avoid excessive alcohol intake. This might seem like a no-brainer, but I used to be a heavy drinker and I know this contributed to imbalanced gut flora and frequent “stomach bugs”. Alcohol is high in sugar content and can offset the beneficial bacteria in your digestive tract and immune system, causing an overgrowth of pathogenic bacteria and yeast which can contribute to weakened immunity and an increase in infections. I still enjoy alcohol from time-to-time, but I usually only have one glass of wine, and usually with food. 3. Eat real, traditional foods. Get in the habit of buying single-ingredient foods and preparing meals at home from scratch. A variety of real, organic foods raised and produced the way nature intends supports healthy gut flora and overall wellness. This includes animal foods from pastured sources. These foods are some of the most abundant sources of fat-soluble vitamins A, D, E, and K2, Vitamin B12, Omega 3s, CLA (conjugated linoleic acid) and minerals which are largely absent from the modern food supply, and are critical for supporting health and preventing disease. 4. Consume fermented foods daily. Fermented foods contain probiotics, or friendly bacteria which support our digestive health and overall well-being. Homemade fermented foods such as sauerkraut, pickles, yogurt and kefir from raw dairy are especially rich in valuable nutrients that support wellness. 5. Consume mineral-rich foods and beverages. This includes homemade bone broth from the bones of animals and birds on pasture, beverages such as beet or other type of kvass, nettles or other herbal infusions, kombucha, water kefir, raw milk, and filtered water with sea salt. See this article for descriptions of these and other nourishing beverages to support health. I recommend these real salts via Amazon affiliation: Celtic Sea Salt, Real Salt, Minera Dead Sea Salt. I also recommend these liquid mineral supplements: Fulvic Ionic Minerals and Vital Earth. 6. Get enough rest by going to bed at a relatively early hour (by 10 p.m.). This might also seem as though it goes without saying. But, if your body is well-rested, it will be much less vulnerable to bacteria it comes into contact with that could compromise your health and make you feel unwell. 7. Receive moderate, regular exposure to the sun. The sun has magical, healing powers. We all need Vitamin D, and sun exposure is one of the primary ways we get this critical nutrient. 8. Avoid the use of antibiotic drugs, antibacterial cleaners and other products. Antibacterial and antimicrobial substances remove all bacteria, including the beneficial variety. Beneficial bacteria help reduce and eliminate harmful bacteria that can make us sick. Removing beneficial bacteria contributes to more incidence of resistant bacteria that can make us ill. In one study from UC Davis, the ingredient triclosan was observed to disrupt hormones. In another from Tufts University, various repercussions to health were shown including the development of tumors and thyroid function disruption. There is also a known risk of harm from exposure to dioxins, a family of compounds ranging in toxicity that are linked to triclosan. These dioxins are considered carcinogenic. Other issues include antibiotic resistance and environmental damage. Read 10 ways to protect yourself from superbug bacteria. 9. Find stress relief that works for you. Just as when we don’t get enough sleep, too much stress can cause our bodies to become vulnerable to illness. So whether that is some kind of exercise, movement, or meditation/prayer, relaxation and stress relief are important to our continued state of well-being. 10. Take activated charcoal at the first onset of nausea or stomach distress. Activated charcoal is effective in pulling out toxins from the intestinal tract. It is a safe substance that has been used for thousands of years. It is commonly used in medical environment to treat overdoses or poisonous substances materials that have been ingested. Activated charcoal works by adsorbing the contaminant. I recommend Nature’s Way via Amazon affiliation. 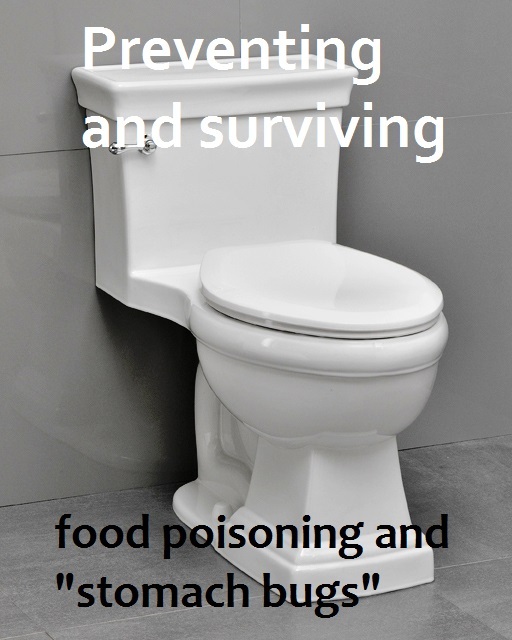 How have you dealt with food poisoning or gastrointestinal illness? This post is so helpful! A great reminder that I need to order some of the heavy duty probiotics. We’ve been out for a while and have just been relying on kombucha. I had food poisoning twice in my life and it was awful both times. My husband has more often than I have, so I like to keep activated charcoal on hand for him when he starts to feel pretty yucky. It has been a lifesaver for him. I’m really good about what I feed my family, but he does his own thing when he’s not at home. I’ve had food poisoning or something like it more times than I can count, as I used to get it a lot when I was eating processed foods. I’m so thankful I don’t get this anymore, and I’m sure you are thankful you haven’t had it more than a couple of times. I really had the p**p hit the fan yesterday (not literally, of course, lol- what a topic)! I was under a lot of stress and my whole body was vulnerable, as you mention. I got nauseated and an unhappy tummy… etc! Vulnerable to a virus! I didn’t know about Enzyme Formulations Formula #17. Nice to learn about that. Thanks, Raine!! Excellent information. By the way, as you said, I got over my tummy distress so fast this time!! I used charcoal and bone broth. I am mostly well today, a really short time-period of discomfort. I, like you, used to throw up multiple times each year growing up! No fun! Megan, yes, charcoal is definitely a good one to use! I told Emily I was going to add it to this article and I still intend to do that! Thank you for another good reminder! Get on the newsletter list! Want Real Food Plans Real Easy?